One of the hottest tickets in the world right now is Hamlet, starring Benedict Cumberbatch, at the Barbican Theatre in London. I wanted to see it so much, I thought about traveling there, but aside from the cost, the tickets sold out long ago. Then a friend invited me to see Hamlet, starring Benedict Cumberbatch, live at our local San Franicsco Bay Area movie theater. No joke! On October 15, the stage production was broadcast, live and delayed, to theaters all over the world. 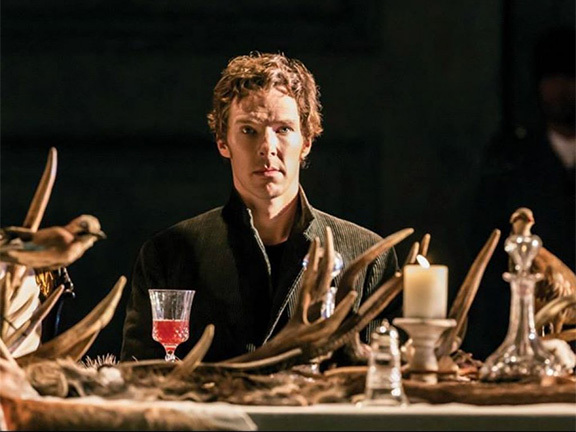 Benedict Cumberbatch was brilliant as Hamlet: moody, mercurial, brooding and funny. He throws himself into the character and the play, and the takes the audience on a wild, energetic ride. He’s an active Hamlet who can’t sit still even as he chides himself over his own inaction. The setting of the play is timey-wimey, half-contemporary and half-vintage. The costumes and the sets were disjointed, but so is Hamlet’s mind, so it worked. The rest of the cast contained an admirable assortment of actors who were up to the task of performing with a world famous celebrity. It was an amazing experience, but what was even more amazing is that our theater was only half full. I don’t think this was due to lack of interest in Shakespeare. I wouldn’t have known about this showing if my friend hadn’t told me. There were no advertisements or trailers in movie theaters that I saw. Nothing on social media caught my eye. My friend happened to belong to a mailing list and got the notice. I’m certain our theater and theaters all over the U.S. would have sold out if the showing had had some advertising. I feel bad for people who missed it. But never fear! Encore performances of Hamlet will be shown in local U.S. movie theaters soon, via National Theatre Live, an organization that brings live stage plays to movie theaters worldwide. They have a mailing list, which I’ve subscribed to now. No more missing out on great theater, like Coriolanus, starring Tom Hiddleston, which had been previously broadcast live. Here’s where you can find encore performance information for Hamlet. If you love Hamlet or Benedict Cumberbatch, or both, this is not to be missed.